I mentioned before, there are a lot of different names for yuan. There are also an absurd amount of denominations. Apparently there are 500元 and 1000元 bills also. I've only seen 1000元 bills once (see below). 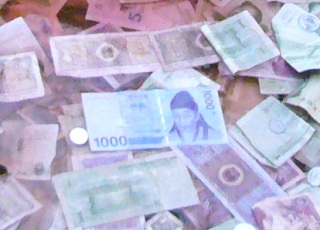 The ATMs dispense 100元 notes, but 1元 and 10元 are probably the most useful. There are, however, MORE bills! A tenth of a Yuan is a jiao (角, also a nickname for money itself, confusing right). There are two denominations of jiao bills: the 1角 and the 5角. This is like having a bill for a dime and a 50 cent piece. But don't worry. THEY ALSO HAVE coins for those denominations. Along with coins for 1元. And, in case that wasn't enough. In addition to bills and coins for tenths of yuan, there are coins for hundredths of yuan (pennies). These are called fen (分) and are lightweight, come in 1, 2 and 5 denominations, feel like children's play money and are an abomination unto the lord. Let's do the math really quickly to see why. That means each fen is equal to $0.00146. And people bother giving me a fen as change sometimes. Usually people give fen to beggars or throw them into wishing wells at temples. I'm not sure why any god or temple would want fen, or even jiao. A really industrious beggar could gather up 70分 (7角 for those of you paying attention) and buy a steamed dumpling from a street food vendor. For those of you paying attention: Yes - you can buy a delicious, delicious street dumpling for $0.10. Not all people mock the heavens by throwing a pittance into the wishing well. I was recently at the Lama Temple and noticed my first ever 1000元 note. 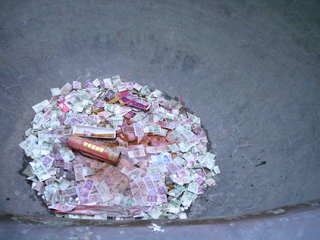 Someone wished for good fortune by throwing a bill worth $146 into a pile of perfumed oil. Now THAT is baller praying.